Lest you were worried that studios have run out of ideas for new films, here's yet another prequel/reboot/sequel/whathaveyou to confirm those fears for you. I'll shut up about this soon, but it's out to mid-June before there's an original film of any significance. At the very least, it's a film that appears to be quality. Alien: Covenant, the fifth film carrying the Alien name but really the sixth in the series and the second chronologically and oh no I've gone cross-eyed... follows up 2012's Prometheus with a colony ship landing on a distant and peaceful... too peaceful planet. Discovering the android David (Michael Fassbender) still remaining from that last doomed mission, it soon becomes clear that something sinister and vicious and predatory is out to get them all. 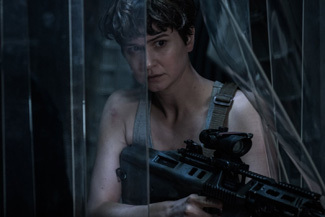 Returning more to its sci-fi horror roots, away from the action films that have dotted the series since the first one in 1979, Ridley Scott also has come back to re-stamp the franchise with his style. While Prometheus was bogged down with a confusing plot and somewhat baffling mythos, Alien: Covenant gives us what we've been looking for all along – a small crew with no help coming versus a pure animal instinct with razor sharp teeth and acid for blood. In addition to Fassbender returning, it adds (a barely recognizable) Katherine Waterston, Billy Crudup, Danny McBride (in a rare non-comedic role) and Demian Bichir, leaving it light on the top-line talent, instead relying on the Alien name and some really fantastic and moody advertising. Despite the missteps in some of the Alien sequels, there's definitely an appetite for more in this series, as the $50 million plus opening of Prometheus showed when the ads merely hinted around the idea that it was connected to it. Some idiot plotting might have done some damage here, but it's also decided to go right for the jugular, plus giving us some of our first real looks at the Alien in daylight – showing a new confidence with the FX. It's stunning work, and hints that there might be deeper content within. While Scott has been hit or miss lately, his big budget work has at least shown ambition. This all leads into what should be around $40 million to start this weekend.